With so much talk in the days since Tyrone’s crucial win over Monaghan in the All-Ireland Quarter-final at Croke Park with divergent opinions expressed on all matters of the game, that conversation is due to intensify at a Club Tyrone chat show in Garvaghey on Thursday 20th, throw-in at 7pm. 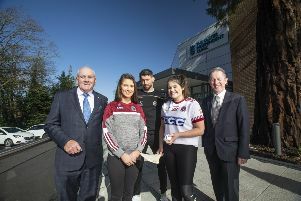 Tyrone Gaels having the wind in their sails with the team’s ongoing march towards another All-Ireland title, debate is ragingin in homes, on street corners, in the workplace and at church gates, this prompting Club Tyrone to respond by convening this chat show. Chaired by Noel McGinn from Teamtalkmag, the ex-county player will be joined by three times All-Ireland medal winner Philip Jordan, Armagh great Jarlath Burns and outspoken columnist Paddy Heaney for a discussion sure to arouse much interest and debate just three days ahead of the game against Kerry. In addition, the evening will recognise the first 50 Tyrone Dragons who have signed up with Club Tyrone to support the County’s new Acadamh Thir Eoghain, the radical re-structuring of youth football development in the county. Admission to the Club Tyrone pre-match chat show is free and open to anyone to attend.